This Norman Rockwell Santa Claus painting, Extra Good Boys And Girls, appeared on the cover of The Saturday Evening Post published December 16, 1939. 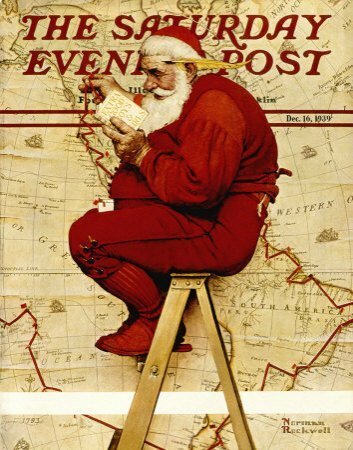 This Norman Rockwell Santa Claus painting was the 191st overall of 322 total published Norman Rockwell Saturday Evening Post covers. Rockwell's career with the Post spanned 47 years, from his first cover illustration, Boy With Baby Carriage in 1916 to his last, Portrait of John F. Kennedy, in 1963. This was also the seventh of 1939. The original oil on canvas painting, 37 x 29 inches or 94 x 73.5 cm, is housed in a private collection. in Norman Rockwell, A Definitive Catalogue by Laurie Norton Moffatt on page 143. A photograph of the model for Santa is reproduced in Norman Rockwell: Behind the Camera by Ron Schick on page 96, as is the painting. taken This Santa Claus picture continued The Post's long tradition of presenting a Norman Rockwell Christmas painting on its cover. This is one of the classic Santa Claus images of all time. Not just by Norman Rockwell, but by any artist. Rockwell doesn't just nail his depiction of Santa in this painting. He doesn't just capture Santa's essence. He defines a scene from Santa's everyday life. Santa does this activity every day of the year. There is no way he could keep up if he did not stay right on top of the situation. Rockwell was always concerned with the details involved in any illustration. In this case, the whole painting is a detail. In this painting, we see Santa plotting his flight path for Christmas Eve. His book is titled "Extra Good Boys & Girls" and apparently contains the names of the best Boys and Girls in the world. Maybe they get their Christmas gifts earlier than the plain old Good Boys and Girls. That book does look smaller than the lists we have seen in previous Norman Rockwell Santa Claus paintings. There is apparently a shortage of Extra good boys and girls. There is a lot of flight time between the marks on tha map. We are left with a question. Where did Santa keep such a huge map? Sitting on a ladder to access it suggests that the map is indeed huge. Maybe he has a Map room or a situation room in his complex at the North Pole. It is apparently quite a responsibilty to be in charge of accounting for who is Good, Extra Good and Bad. I hope my name is in the book in his hand.